STSA meeting attendees can now reinforce their learning experience at the 59th Annual Meeting by referencing the following audio and video presentations. 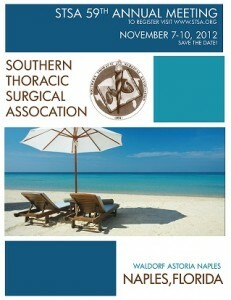 If you weren’t able to join STSA in Naples, catch up on some of the educational sessions that you missed out on. The Southern Thoracic Surgical Association is accredited by the Accreditation Council for Continuing Medical Education (ACCME) to provide continuing medical education for physicians. STSA designates the 59th Annual Meeting for a maximum of 21.25 AMA PRA Category 1 Credit(s)™. Physicians should only claim credit commensurate with the extent of their participation in the activity. Contact STSA Headquarters at stsa@stsa.org or 312.202.5892 to request a copy of your CME certificate or certificate of attendance.